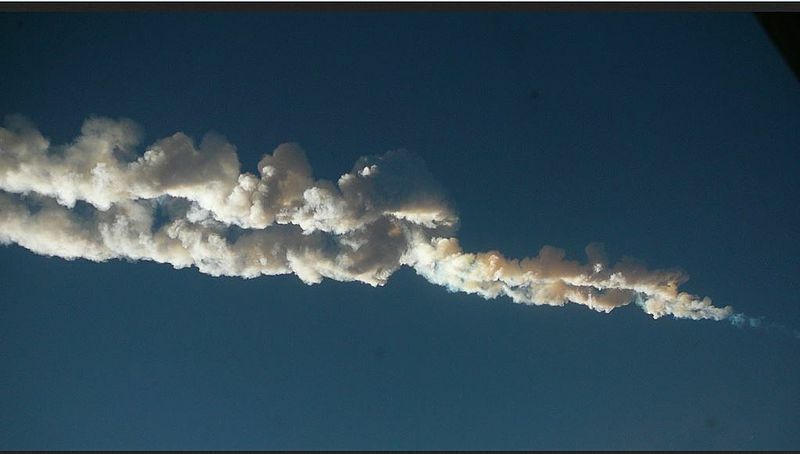 The meteor which burnt up over Chelyabinsk, Russia, on 15 February 2013 was so large that it left a long-lasting trail of smoke in its wake. Most meteors completely vanish within a fraction of a second. Shooting stars appear when pebble-sized lumps of space rock crash into the Earth. Because they are travelling so fast, they burn up when they hit our planet’s atmosphere, leaving a fiery trail across the sky. Millions of shooting stars appear around the world every day. The Solar System is teeming with rocky fragments of material which never stuck together to form planets, and astronomers estimate that over 100 tonnes of this material collides with the Earth every day. Thankfully, the vast majority of it burns up at an altitude of over 50 miles, posing no hazard to anyone on the ground. By recording videos of these rocks burning up, we can count how many of them there are. By comparing videos seen from multiple locations in East Anglia, we can triangulate the exact altitude and trajectory of each shooting star, telling us where each one came from. Eventually, Pi Gazing will allow us to trace out how space rocks are distributed through the Solar System. Why are many Pi Gazing images blank? 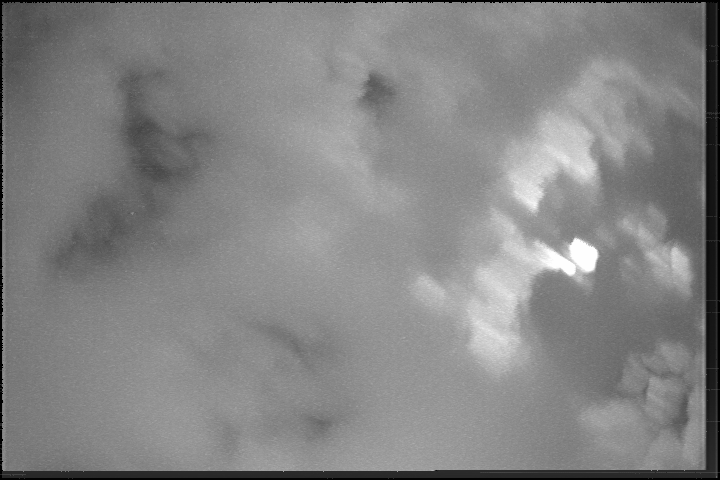 Pi Gazing cameras observe on cloudy skies as well as starry ones. Sometimes the Moon or twilight can dazzle them! Our cameras observe from nightfall until dawn every day, even when the weather is bad. In the UK, most places have clear skies on one night in three, so roughly two thirds of Pi Gazing images show cloudy skies. Around twilight, the images often appear completely white. This is because we use very sensitive cameras that are designed to see faint stars on dark nights. When the sun comes up, they're often completely overwhelmed by the amount of light they see! Can I build my own Pi Gazing camera? The collection of hardware found inside a Pi Gazing camera. Yes! We are very keen for amateur astronomers and others to get involved. 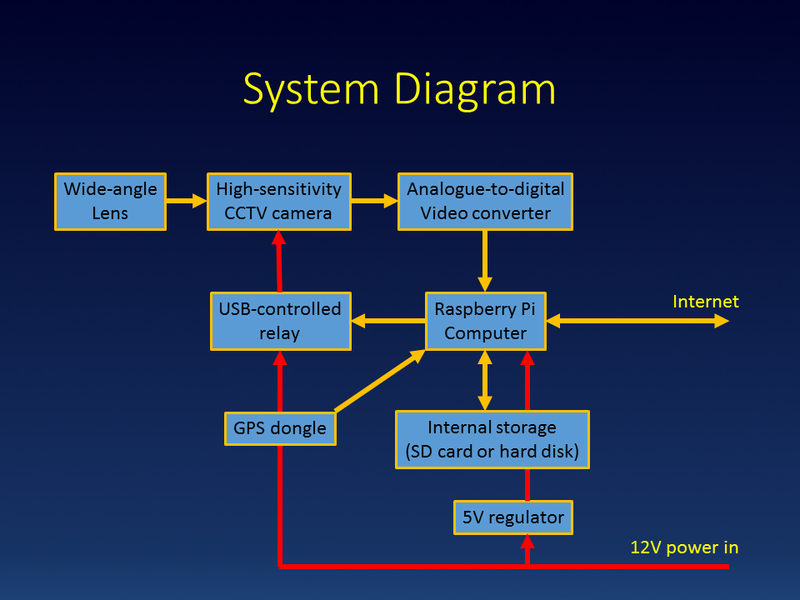 All the hardware designs and software used by the Pi Gazing cameras are open source, and can be found on our GitHub pages. Not only are they free to download, but you're also welcome to change them and see if you can make them work better! 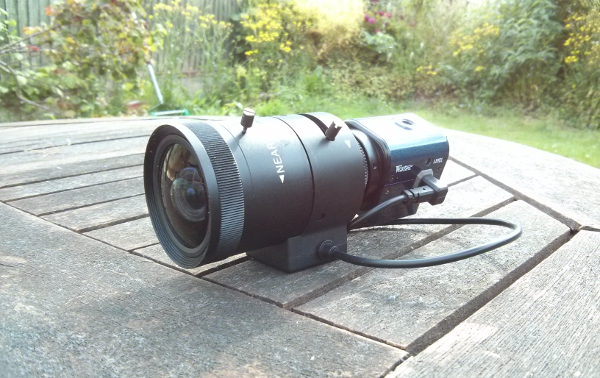 The cost of building a camera is around £300–£400, depending on optional extras. You can find a complete guide to how to build your own camera on our GitHub pages. If you'd like to get involved, why not get in touch with us via Facebook or Twitter? Why are the pictures black and white? We use the most sensitive security cameras we could find, with large lenses on the front to catch as much light as possible. When we designed the Pi Gazing cameras, our priority was make them as sensitive as possible to very faint objects in the night sky. Colour cameras are much less sensitive than black-and-white ones. They have an array of light-sensitive elements inside them, each of which sits behind filter which makes it sensitive to only one colour. Any green light which falls on a red pixel, for example, isn't detected. Black-and-white cameras have at least twice the sensitivity of color cameras, because they don't have any filters inside. So, although this makes the pictures slightly less pretty, it means we can see stars that would be invisible to a colour camera.